The order Diptera ('di' meaning 'two', and 'ptera' meaning 'wings') are distinguished from other insect orders by the development of their hind wings into 'halteres', which the insect uses to detect body rotation during flight, and their larval stage, which lacks true legs (Cranston & Gullen, 2010). 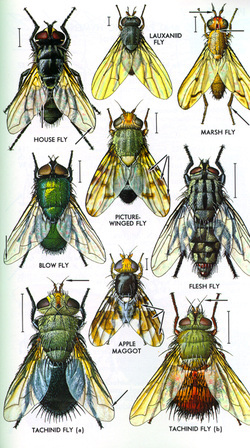 They are often called the 'true flies', and contain over 100,000 described living species (Cranstom & Gullen, 2010). Calliphoridae (Blow flies, green bottle flies, blue bottle flies etc): these are among the first flies to colonize a corpse which is not buried, due to their ability to smell death from up to 16 kilometers away (Gennard, 2007). Calliphoridae are probably the most widely used insect in forensic entomology (Wallman & Donnellan, 2001). Sarcophagidae (Flesh flies): some species within this family lay eggs in open wounds, so presence of these species can identify any injuries the corpse had prior to decomposition (Gennard, 2007). Phoridae (Scuttle flies): have an active flight period from April to November, which can assist in the determination of PMI (Gennard, 2007). Using the life history and ecology of these insects assists forensic entomologists from determining not only the post-mortem interval (PMI), but also the place, and perhaps something of the manner of death (Wallman & Donnellan, 2001).